Currently, I am playing with the new Windows Azure Web Sites feature. Although the free version lacks custom host names support (which is promised to be possible in the future by Scott Guthrie), it is a pleasure to work with. I am currently working on a small website, based on WordPress. The development version is currently hosted on Azure using this manual: https://www.windowsazure.com/en-us/develop/php/tutorials/website-w-mysql-and-git/. 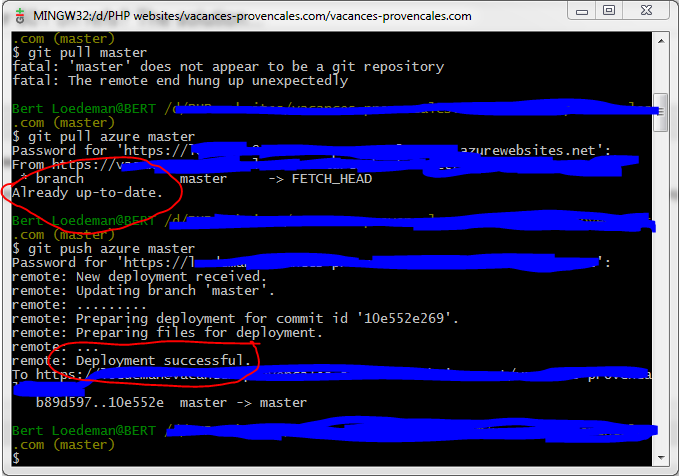 When deploying one of my PHP websites to Windows Azure today using Git (git push azure master), I stumbled upon an error. This entry was posted in azure, hosting, PHP on June 30, 2012 by Bert Loedeman. Since a couple of months I moved my hosting packages to a new host, DIGITALiBiz. The reason I moved in to them is their incredible low pricing considering what they offer. I currently have ASP.NET 3.5 hosting, 350GB disk space and 5 SQL Server 2005 databases of 250MB each. Who can beat them??? After some months of working with DIGITALiBiz, I can say that they have an excellent support team and a very reasonable performance. Definitely recommended! Curious? Have a look at DIGITALiBiz. This entry was posted in asp.net, cheap hosting, hosting on June 30, 2008 by Bert Loedeman.